behind bars. 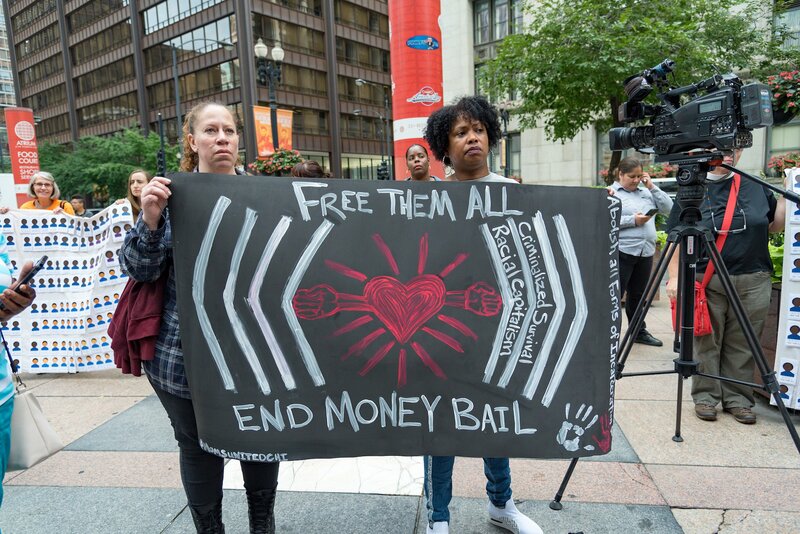 A movement photographer shares images of those fighting to free them and end money bail altogether. 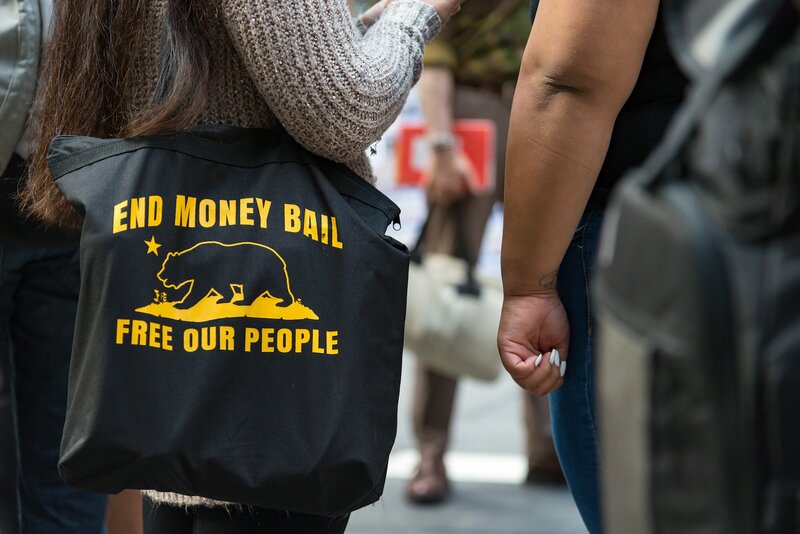 In the U.S. criminal legal system, there is a long history of courts using money bail to ensure that a person accused of a crime shows up for trial after being released. 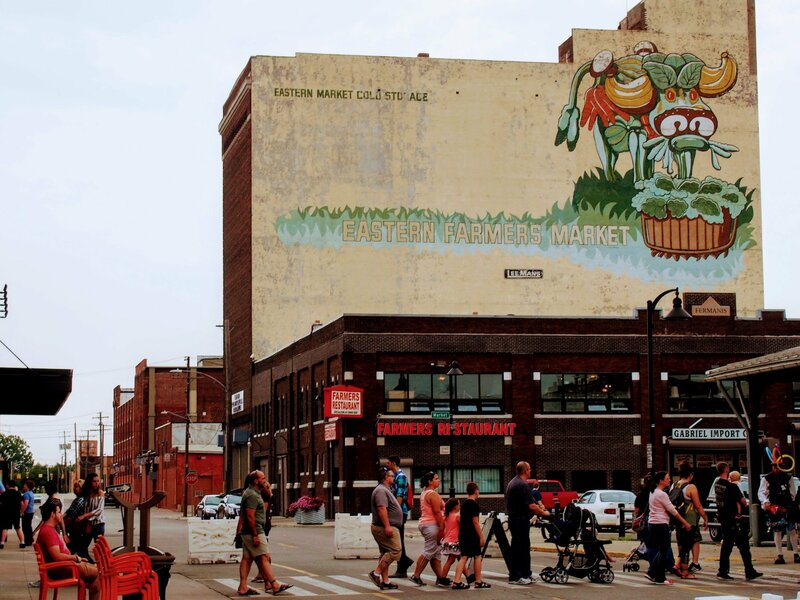 This practice disproportionately punishes low-income people and people in poverty. 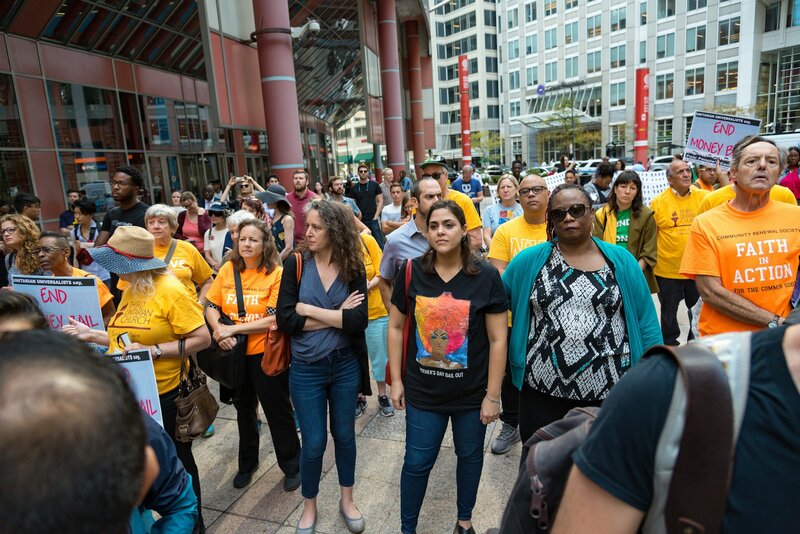 On any given day, in Cook County, Illinois alone, thousands of people who have not yet been convicted of a crime are unable to post bail or bond, meaning that, unlike their wealthier counterparts, they have to endure pretrial incarceration. Many give up waiting and accept unfair plea deals. 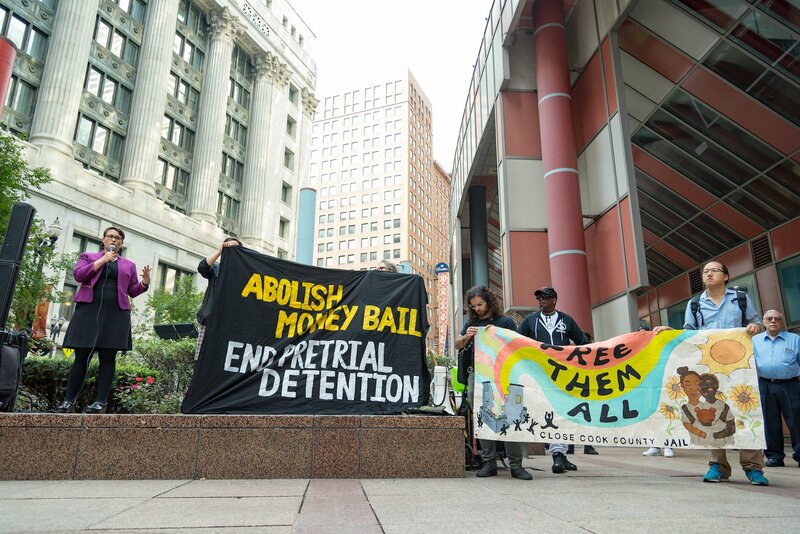 In September of 2017, Cook County Chief Judge Timothy Evans, pressured by community organizers and a lawsuit challenging unaffordable money bail, issued General Order 18.8A, which provided that no one should be incarcerated at Cook County Jail (CCJ) due to an inability to afford bond. Since this order was enacted, the number of people experiencing pretrial incarceration at CCJ has decreased. However, more than a year later, there were still more than 2,500 people in pretrial incarceration at CCJ simply because they can’t afford bond. 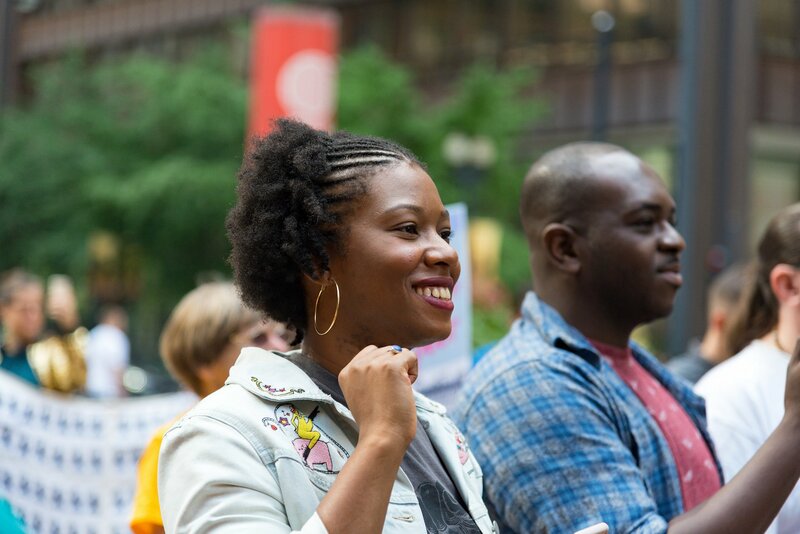 On the one-year anniversary of General Order 18.8A, the Chicago Community Bond Fund (CCBF) and the Coalition to End Money Bond, along with thirty other bail and bond funds from around the country, organized a rally outside Chicago’s James R. Thompson Center to protest the continuation of what is known, among those in the movement, as “criminalization of the poor.” The “Rally to #EndMoneyBail” called for the full implementation of the General Order and reprimanded Cook County judges who were slowly returning to the bond-setting practices common before the order. 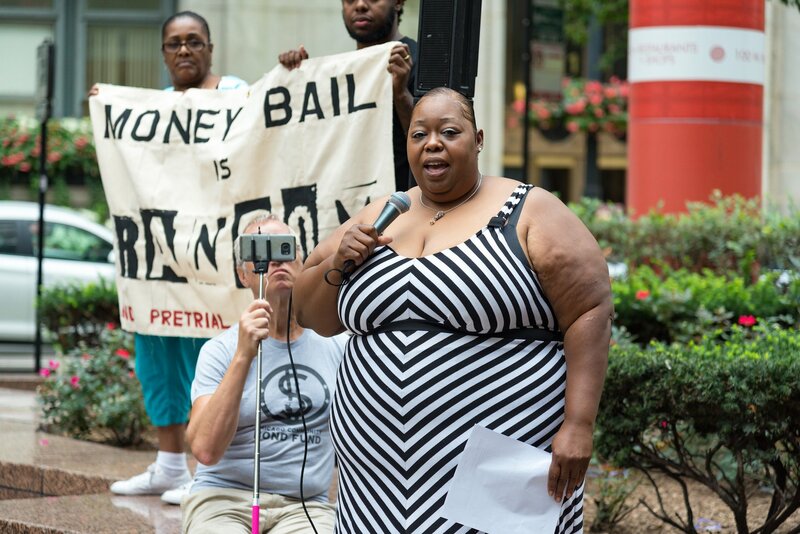 At the rally, clergy, community organizers, formerly incarcerated people and their family members spoke of the effects of money bail and the need for its abolition. 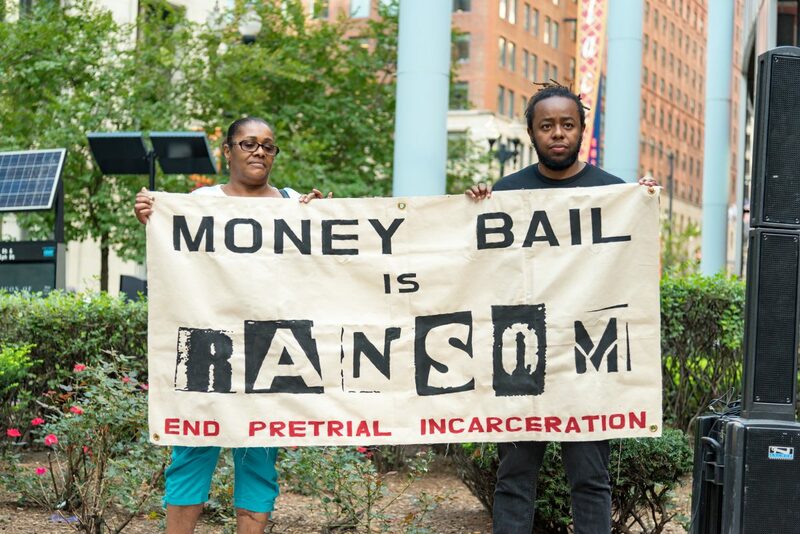 Participants held banners, created by members of For The People Artists Collective, with messages including: “Money Bail Is Ransom: End Pretrial Incarceration” and “Free Them All: Close Cook County Jail.” Some participants held up an interactive art exhibit that consisted of multiple banners covered in seed packets. 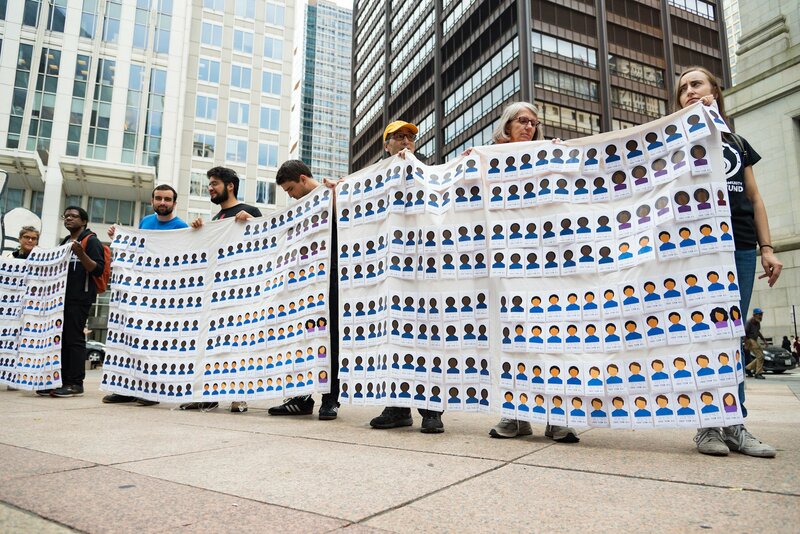 Each packet depicted, by race, one of the more than 2,500 people currently being held in Cook County Jail due to a lack of funds–to give a visual representation of the disparate impact of money bond on communities of color, especially Black communities. Each seed packet contained a bee-sustaining seed mix, which symbolized the potential of each incarcerated person’s life to nourish the broader community, and participants were encouraged to take a packet with them to plant the seeds in their own communities. 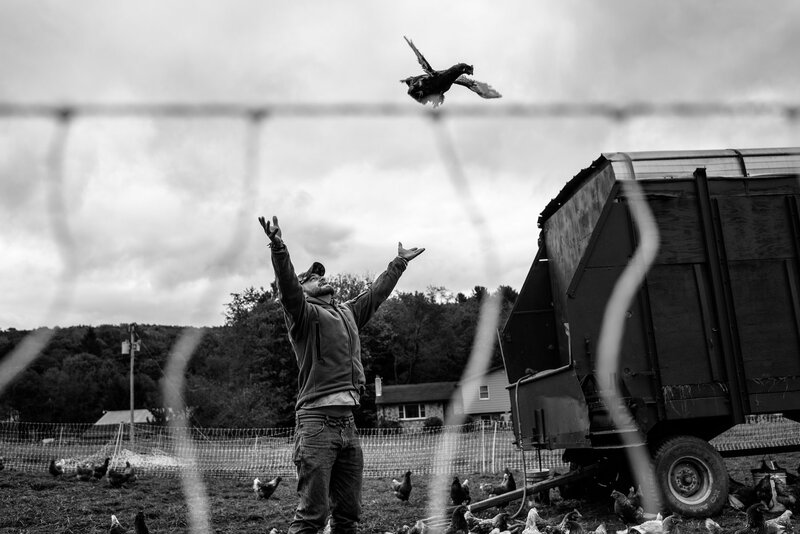 As a movement photographer who is also an abolitionist organizer, I believe that documenting freedom struggles is my contribution to building a vastly different world, one in which prisons, police, and the surveillance state are not needed, the kind of world that I want to leave for my daughter and all young people. We are living in a time of extreme violence against the most vulnerable among us, but it’s also those facing the most oppression who I see rising up in fierce resistance every day. I use the moniker Love + Struggle Photos because, for me, love and struggle are intertwined. The people I see fighting for freedom do so out of deep love for themselves and their communities. 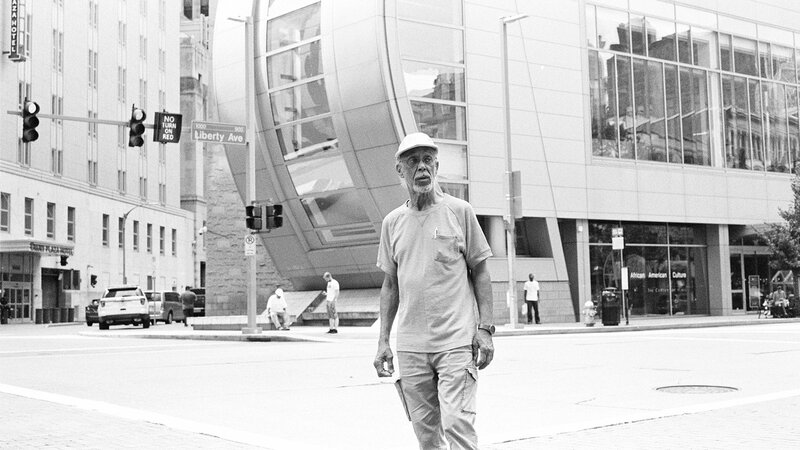 I document that love and those struggles because we need a visual record of both, to remind us where we have come from and help us envision the world we want to build. 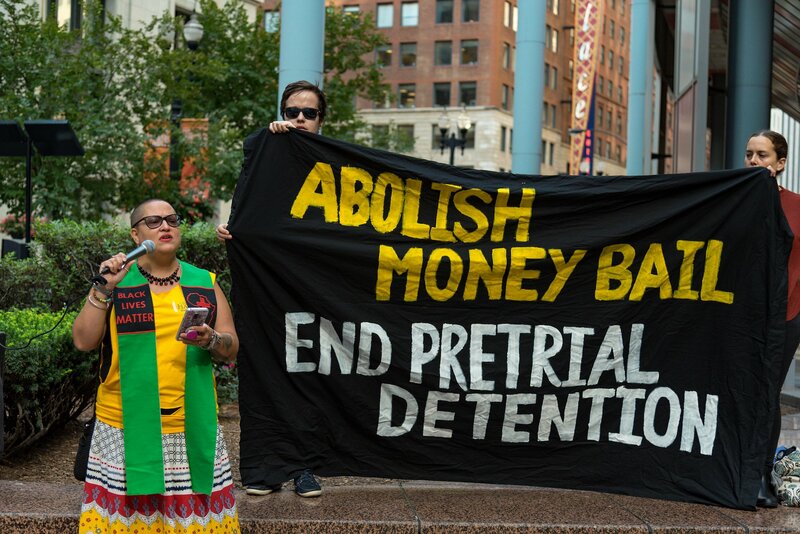 For more information on the campaign to end money bail/bond and pretrial incarceration, visit ChicagoBond.org. Sarah-Ji is a movement photographer and abolitionist who documents freedom struggles in Chicago under the name Love + Struggle Photos. 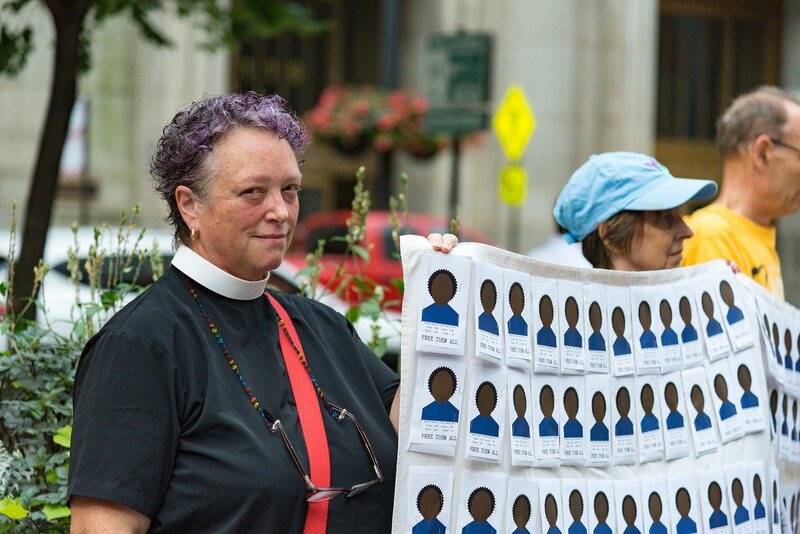 She is a member of For the People Artists Collective and organizer with Love & Protect. She and her teenage daughter Cadence live on the far north side of Chicago.